The sun is shining outside and it is beautiful and warm, I escaped my office to get a walk in over my lunch break. 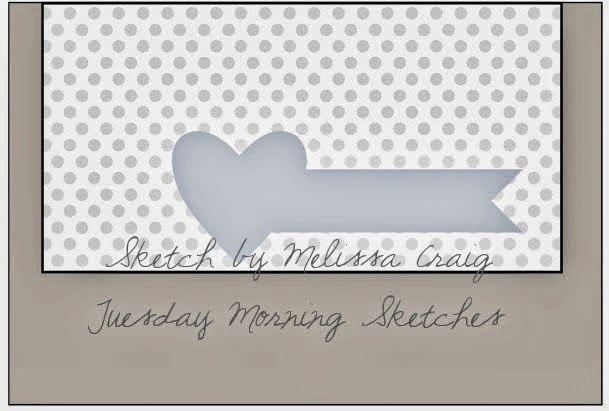 I have needed to create way too many sympathy card as of late, I am using the current TuesdayMorning Sketches challenge as my inspiration. I still have the new DCWV pad on my desk so that is want I used, I cut out the side panel with a Spellbinder die cut then used a Memory Box leave die cut and sentiment to make up what is the oval on the sketch. I finished with some twine and buttons. Supplies: Cream and brown card stock, Designer Paper – DCWV, Verve-Deepest Sympathy, Memory Box and Spellbinders die cuts, twine, buttons. Merry Monday Everyone, it is time for a new change for the Merry Monday Christmas card Challenge. This week the challenge is to use a Gingerbread man or woman on your Christmas Card. I don’t think I have ever made a card with a gingerbread man on it before.. or at least I don’t recall doing so. I created the background layer first then, heat emboss this little dude and fussy cut him out. I heat embossed the sentiment and finished with some twine and gems and pearls. 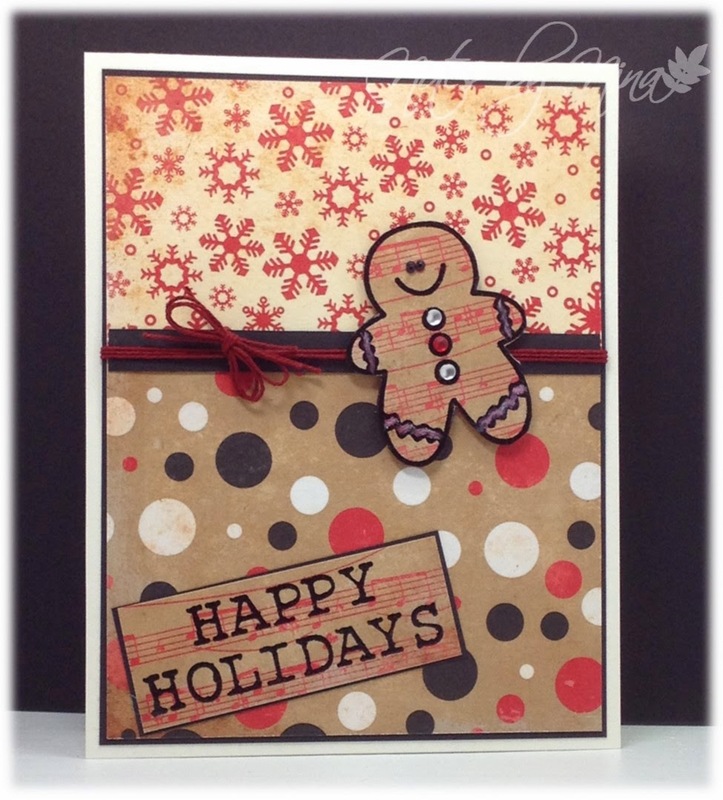 Supplies: Cream and black card stock, Designer Paper – Bazzill Basics, The Alley Way Stamps – No Peeking, Hero Arts – Happy Holidays, twine, pearls, gems. 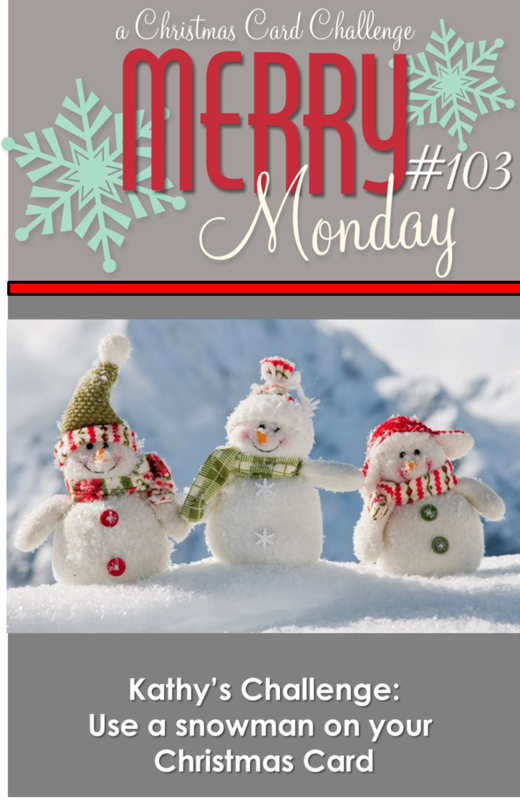 Stop by the Merry Monday Card Challenge blog and take a look at all the wonderful creations by the design team, come play along and get a head start on your Holiday cards. My wonderful husband has a birthday coming up this week. My gift to him is a set of tires for one of his motorbikes, so I wanted a birthday card that reflects that. There is nothing like the open road on the bike in his mind I am sure and I hope he will have a few wonderful days as spring and summer arrive. I had fun making the tires, I cut them out with my Silhouette then embossed them with some texture then head embossed them for a rubberized look. I used a punch for the envelope and made it a double later to get both yellow and black. The sentiment is heat embossed and layered, I finished with some trendy tape and embellishments on the wheels. I will admit to cursing and laughing at the same time when nothing stuck to the tires, glue slipped off, foam tape did not work either. I am hoping the glue dots I finally used with hold. 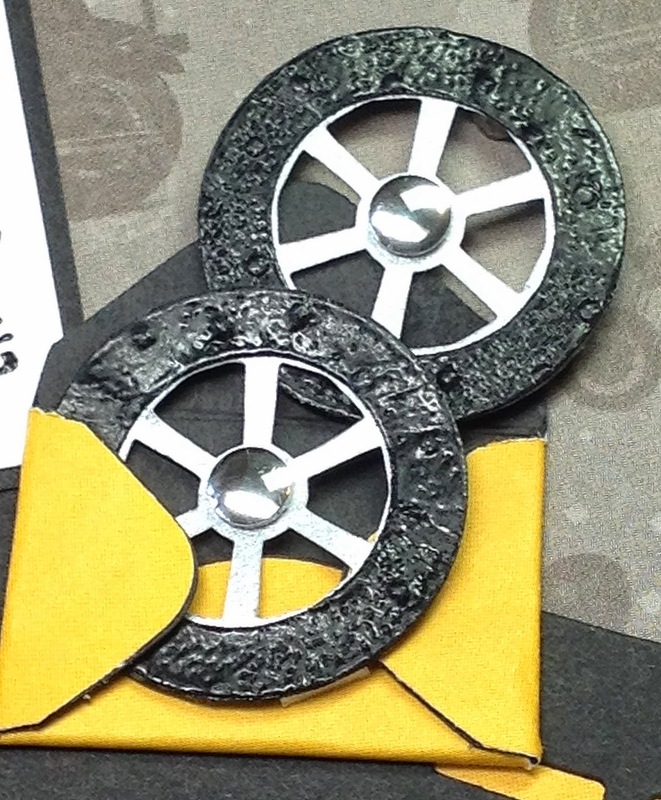 Supplies: White, black and yellow card stock, Impressions Obsession-Sentiment, MFT-DieNamics, Silhouette-wheels, misc embellishment, trendy tape. I have a quick card for the post this morning. I used the papers from the second of the 12 x 12 paper packs I picked up on my recent trip to the States, I love these fabulous prints and colors. I used a simple layout for a CAS card, I added a couple of layers then finished with the die cut flourish, sentiment and pearls. The sentiment is heat embossed and popped up with foam tape. 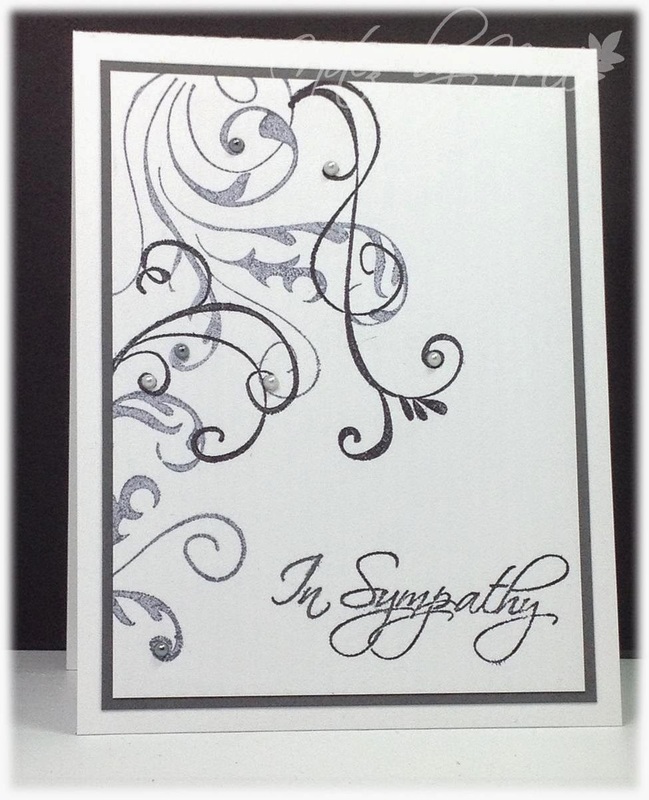 Supplies: White and gray card stock, Designer Paper – DCWV, MFT Die-namics, Verve Stamps-Deepest Sympathy, pearls. I had a fabulous crafty day and I made a good handful of cards. 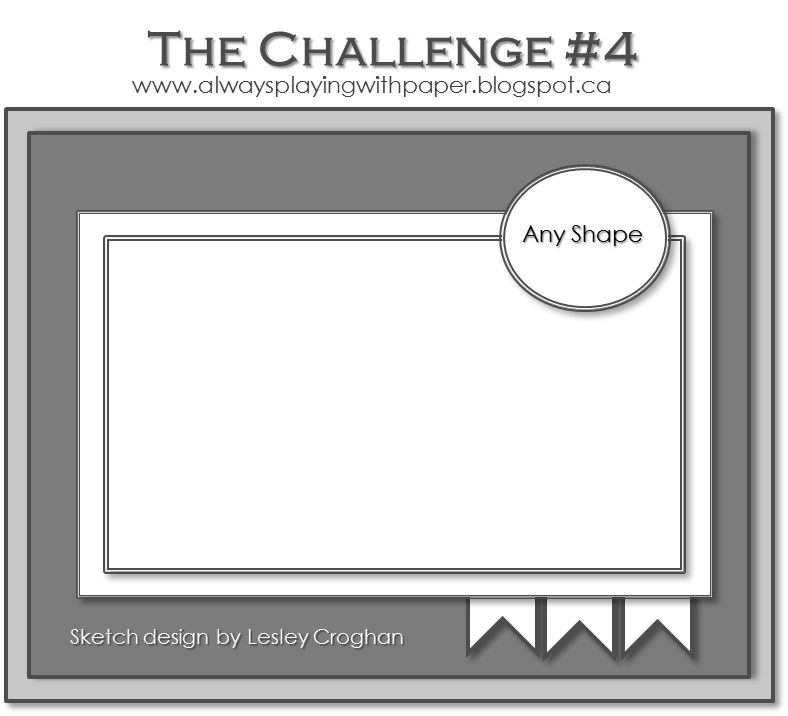 Lesley posted a new sketch for The Challenge that I could not wait to play along. I used a new 12 x 12 paper pack that I picked up at JoAnn's last weekend when we went to Tacoma for the George Strait concert.. On a side note, fantastic concert – George Strait is one of those (in his own words - troubadour) that I have always wanted to hear in person and my wonderful husband made that happen. Anyway, paper pad.. J love the patterns and colours, I am sure this one will be one of my favorites for the next little while. I have to admit to loving this linen ribbon too and made a button with large holes to accommodate the ribbon. Supplies: Cream and brown card stock, Designer Paper – DCWV, Verve – Happy Birthday, Verve Stamp – Happy Birthday, brown linen ribbon, circle die cut. Good Morning all, Happy Easter Monday... it is a Stat holiday for me and I planning to get crafty today, It is also time for a new Merry Monday ChristmasCard Challenge. This week the challenge is to Use a Christmas word or words and decorate each letter on your Christmas Card. I know this card looks really bright, but I think all the glitter has thrown off the color for the camera. The background paper is bright and fun with all the little images. I used a new die cut I have from Avery Elle for the letters which are all heat embossed and popped up with foam tape. I did the same with the stars that are hanging from black glittery twine. Supplies: White and black cardstock, Designer Paper- Bazzill Basics, Avery Elle and Memory box die cuts, red glitter embossing powder. A second quick post this morning and again under the wire. This card is for Lesley's The Challenge. I pulled one of the tags from way way deep in my stash, I added some twine and the butterfly. 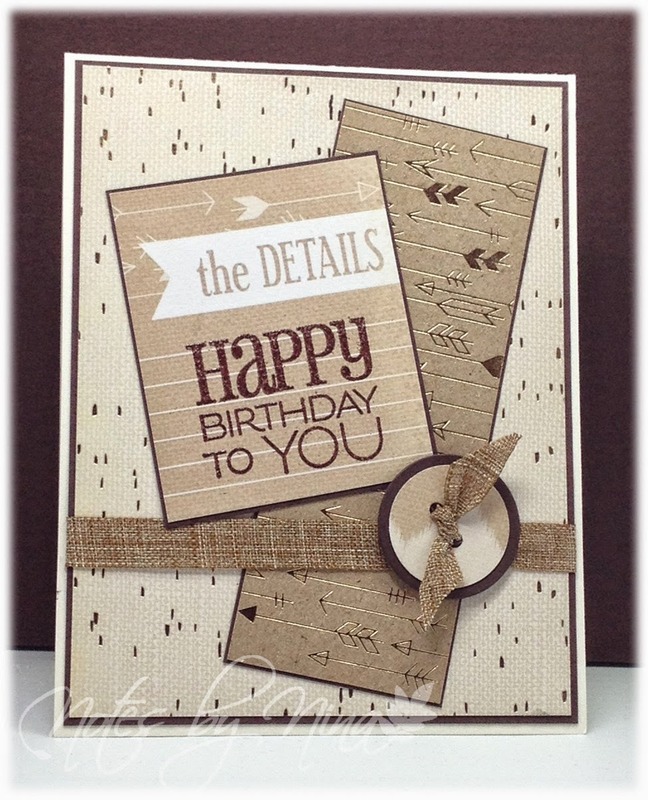 Supplies: Cream and brown card stock, TPC Studio-Happy Birthday, Designer Paper-Simple Stories, Studio 112 -Margo Tags, twine, Spellbinders die cut. Happy Easter :) I have had time all weekend to craft but I seem to have gotten myself stuck on half a card and I can't seem to move on.. I did manage to get this card done for the current Tuesday Morning Sketches but dragged my feet getting it posted and I think I am now slipping under the wire. This card is for Administrative Professionals Week, my husband asked me to put something together for the lady in his office. I stamped the typewriter then printed the sentiments from Microsoft Word then finished with some wood veneer pieces. 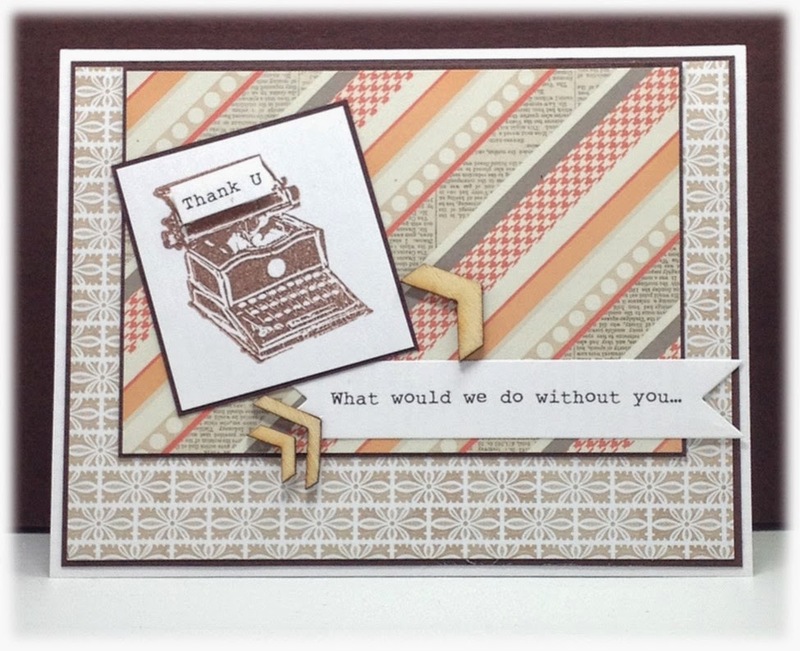 Supplies: Cream and brown card stock, Stampabilities - Typewriter, Designer Paper-Teresa Collins, Studio Calico-Wood Veneer pieces. I have put the half card away and hope to get some creative time today :) wish me luck. 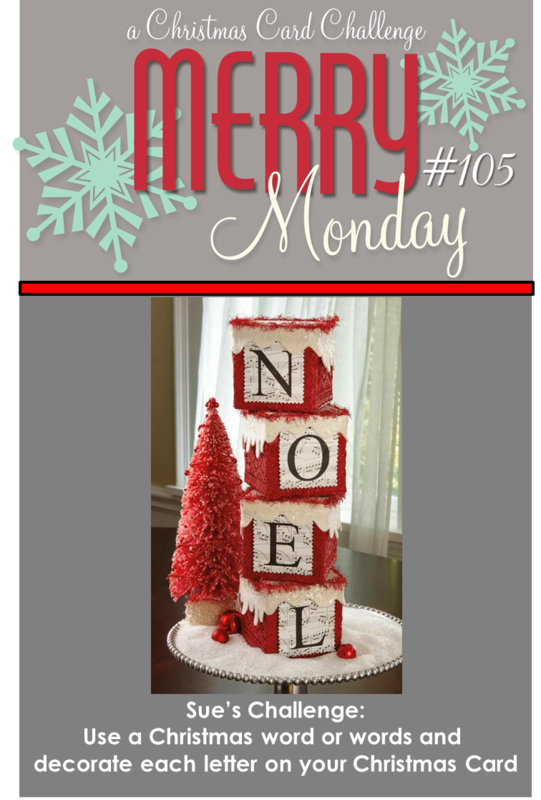 Monday again and we have a new Merry Monday Christmas Card Challenge for you. 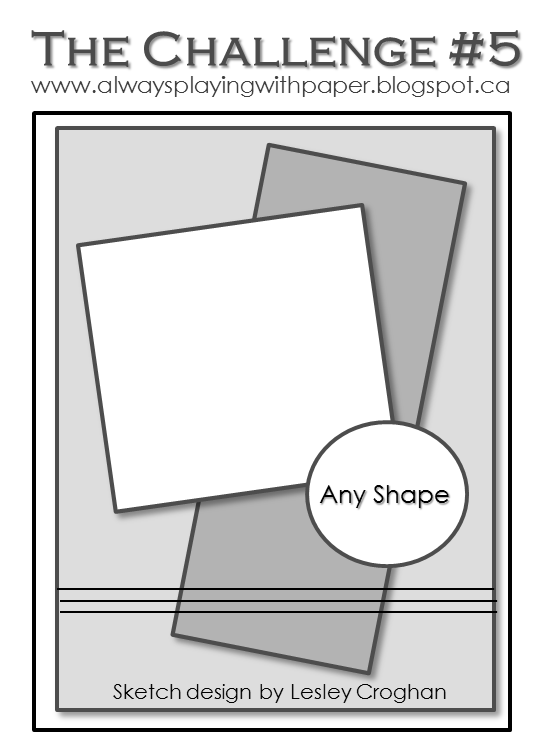 This week it is a colour challenge, use Slate, Kraft and White or Cream on your card. I used a white card base then created layers with dark grey, kraft cardstock and designer paper, I stamped the image on kraft card stock with a gray ink then used a clear embossing powder that made it a little darker and layered it on the grey cardstock and popped it up with foam tape on a white layer. I heat embossed the sentiment in black, the die cut a couple of little birds, one in designer paper and one in dark grey and heat embossed them in clear embossing powder and popped them up with foam tape. 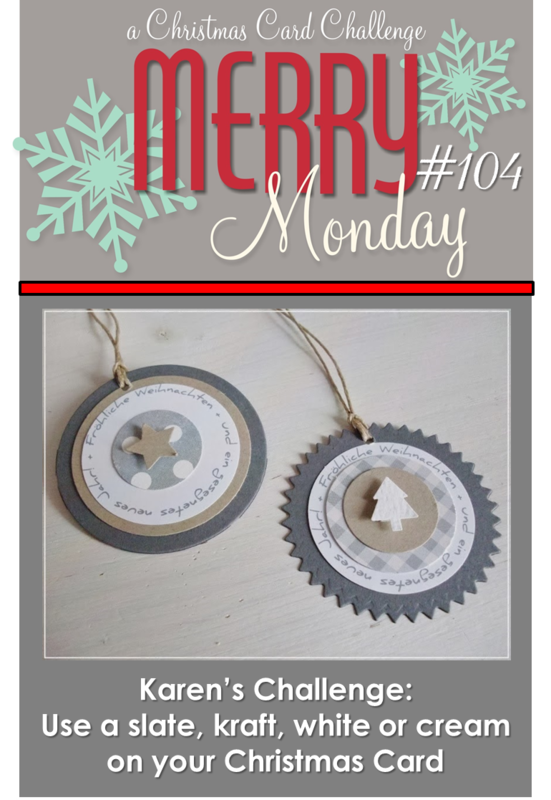 Head over to the Merry Monday Card Challenge blog and take a peek at all the creations by the design team, maybe share a little comment love and your could even play along. 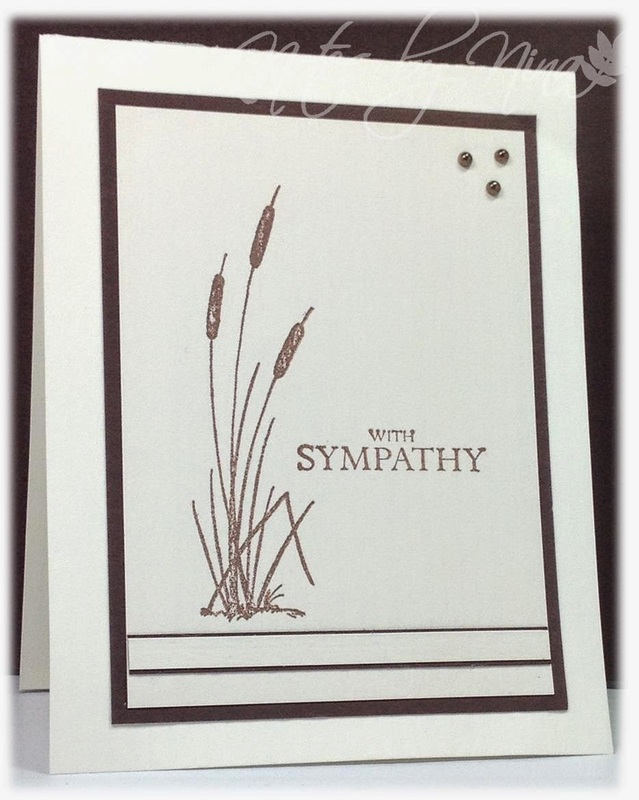 This is the last of the Sympathy cards I did in a set, I love the simple layout. I used a cut file I had in my Silhouette library and altered it to just do the one panel. The sentiment is just a font cut. I am still getting the hang of getting cuts nice and clean. 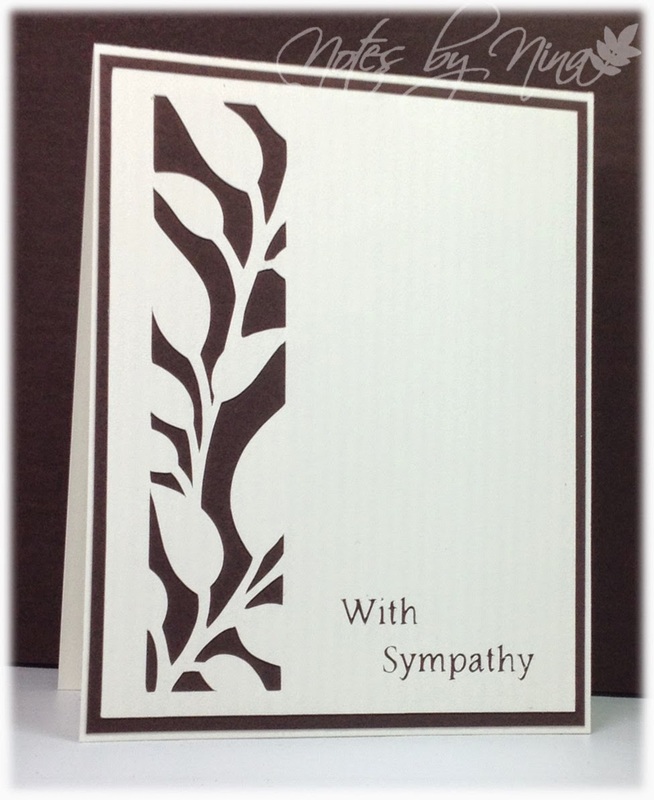 Supplies: Cream and brown card stock, Silhoette cut file and sentiment. 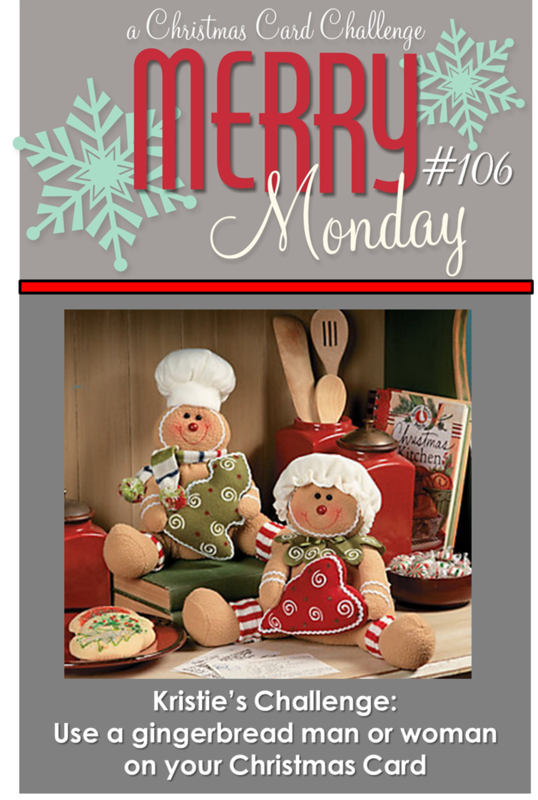 Monday rolls around again.. it means that we have a new Merry Monday Challenge. This week the challenge is to use a snowman on your Christmas Card. 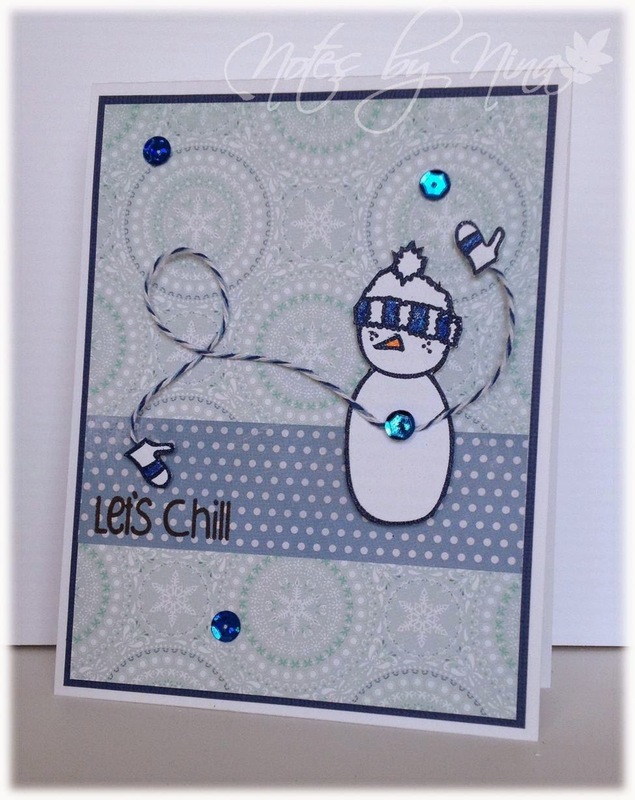 I had fun with this card, I heat embossed the snowman then fussy cut him out as well as his mittens. I used some simple layers and added a heat embossed sentiment. I added some over long twine attached to the mittens and the snowman and his mittens are popped up with foam tape. I finished with some sequins. Supplies: White and blue card stock, Designer Paper – Echo Park, The Alley Way Stamps - , twine, sequins. 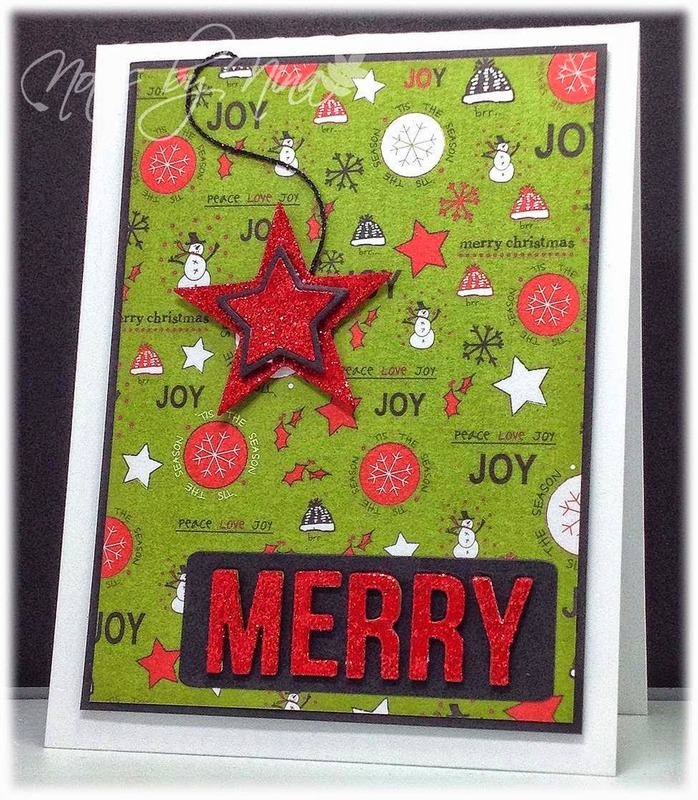 Stop by the Merry Monday Card Challenge Blog to see all the Design Team’s creations, take a little time and play along with us. A quick post this afternoon for a Mother’s Day card that I created, I have seen this technique around on the Internet the last little while and I think I have actually used it before but I like the simplicity of using these little punched envelopes. I punched them all out from the same 6x6 paper pad and then alternately popped them up with foam tape and then I finished with some pearls. Mom is heat embossed in brown, I stamped For My in brown ink. 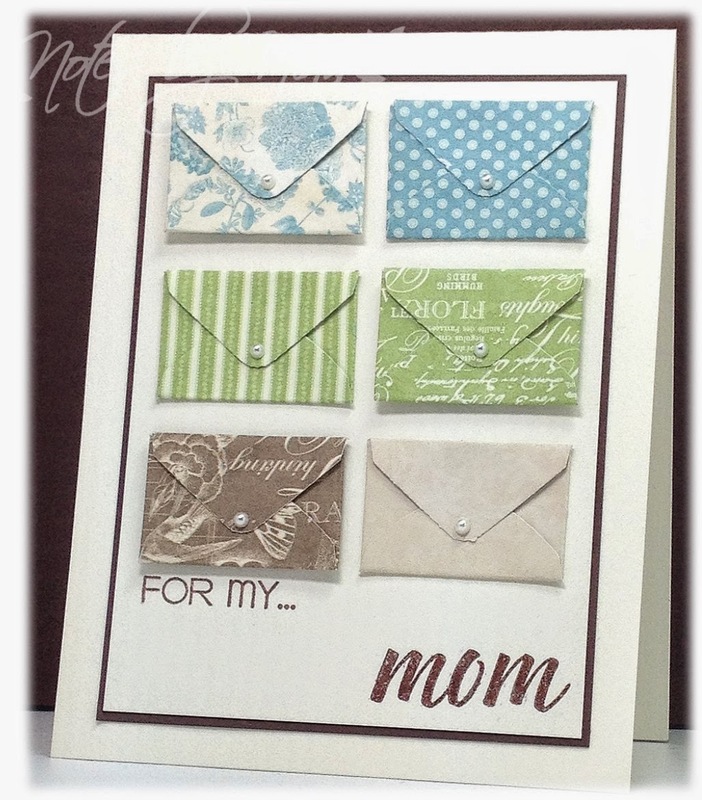 Supplies: Cream and brown card stock, Designer Paper-Graphics 45, The Stamps of Life words4family, envelope punch, pearls. Another sympathy card to post today, I found this scrap of DP in my stash but I don’t recall who made it. I heat embossed the sentiment in brown on Vellum, then die cut the leaf, I finished with some pearls. Supplies: Cream and brown cardstock, vellum, Designer Paper – Unknown, Mermory Box - Lorelai Life die cut, Pearls. I had a wonderful evening crafting with my sister, we had FaceTime going and it was like we were crafting in the same room. This card is for the current Tuesday Morning Sketches challenge, I ended up flipping the sketch and skewing it a little but I am happy with the end result. 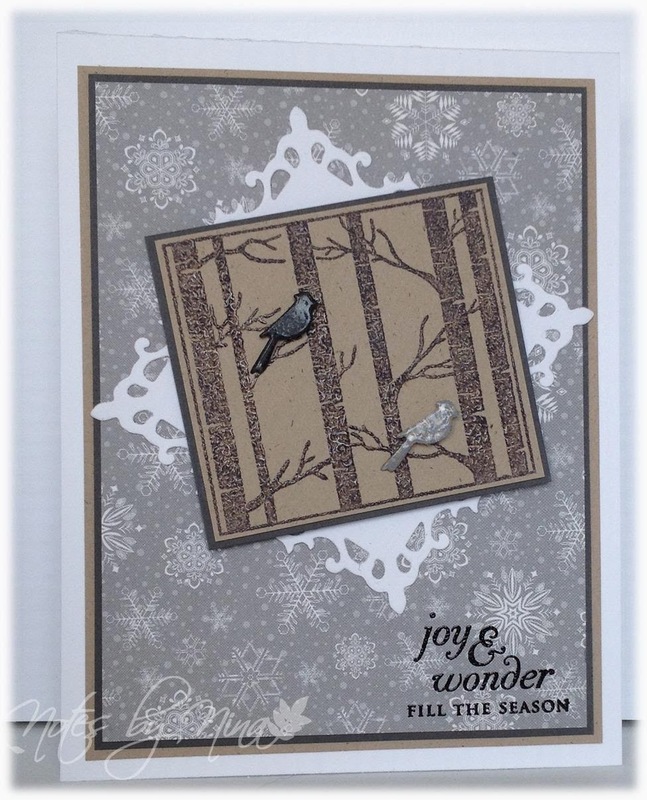 I heat embossed the sentiment and the bird and then cut out the birds DP body. I used glitter markers for his plume and gave him googly eyes. I used my Silhouette for the oval and outline and popped it all up with foam tape. 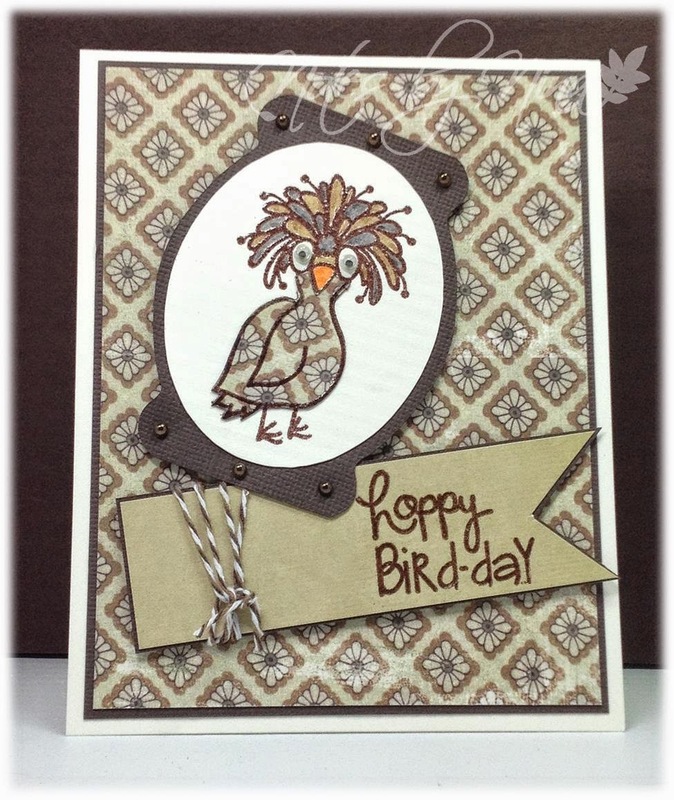 Supplies: Cream and brown card stock, Designer Paper – My Mind’s Eye, The Alley Way Stamps-Birds of a Feather, Silhouette cuts, pearls, twine, googly eyes. This is the third sympathy card I made and another CAS one. I stamped the images and sentiment, I finished with some pearls. 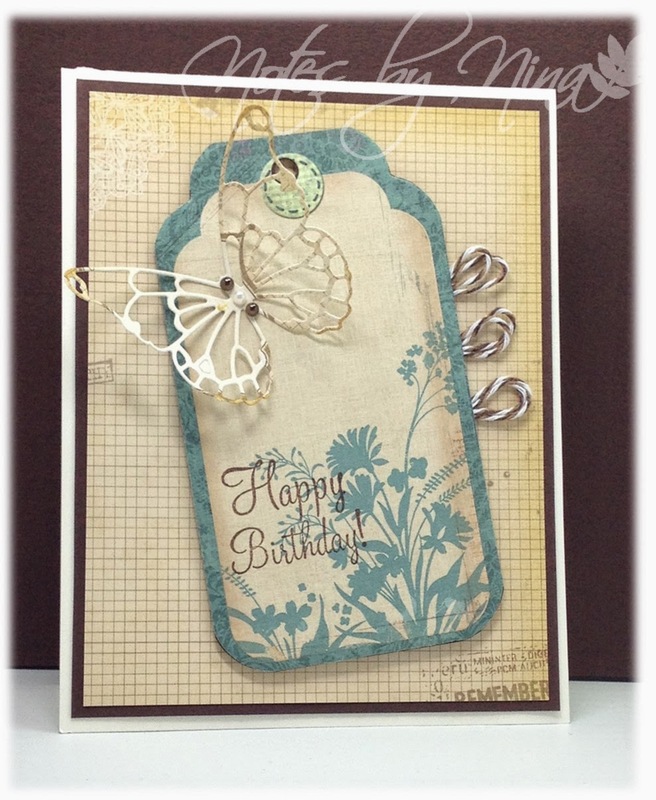 Supplies: Cream and brown card stock, Stacy Stamps – Solid Wildflower Set, Gina K Designs – Labeled with Love, pearls. 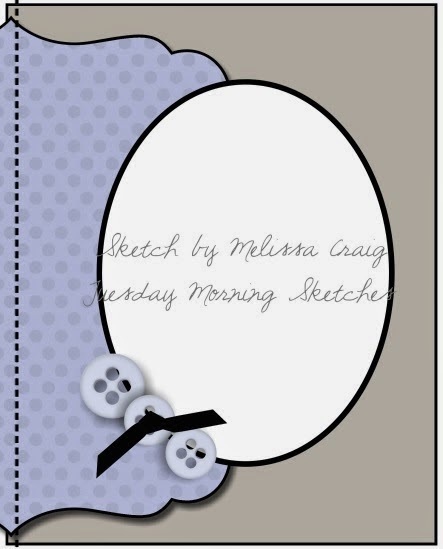 A quick second card for tonight, for this one layer card I stamped flourishes in gray and black. The sentiment is stamped in black and I added white and grey pearls. 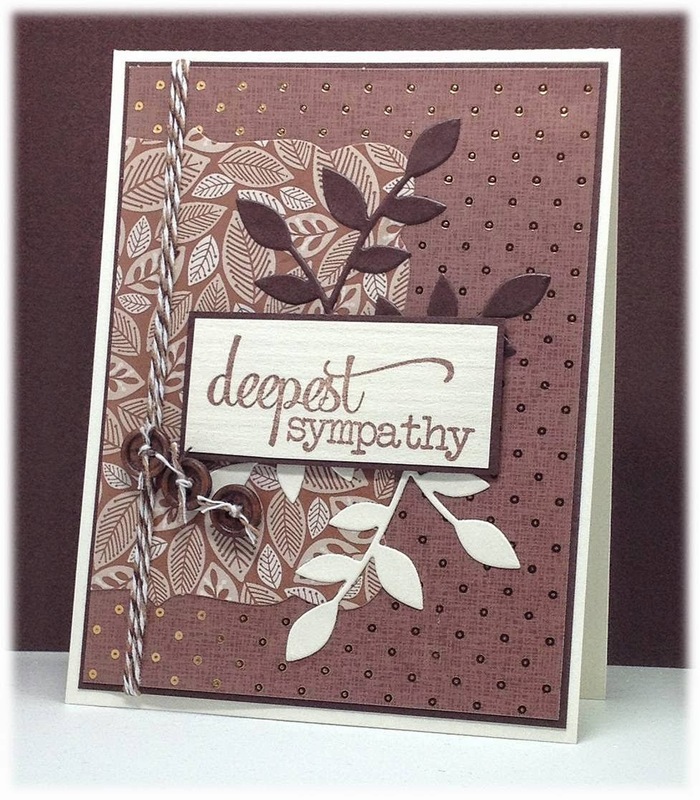 Supplies: White and grey card stock, Stampology – Autumn Leaves, River City-In Sympathy, pearls. We had some sad news in our family this weekend so I needed to make a few Sympathy cards. This is the first of about 5 that will go out in the mail. 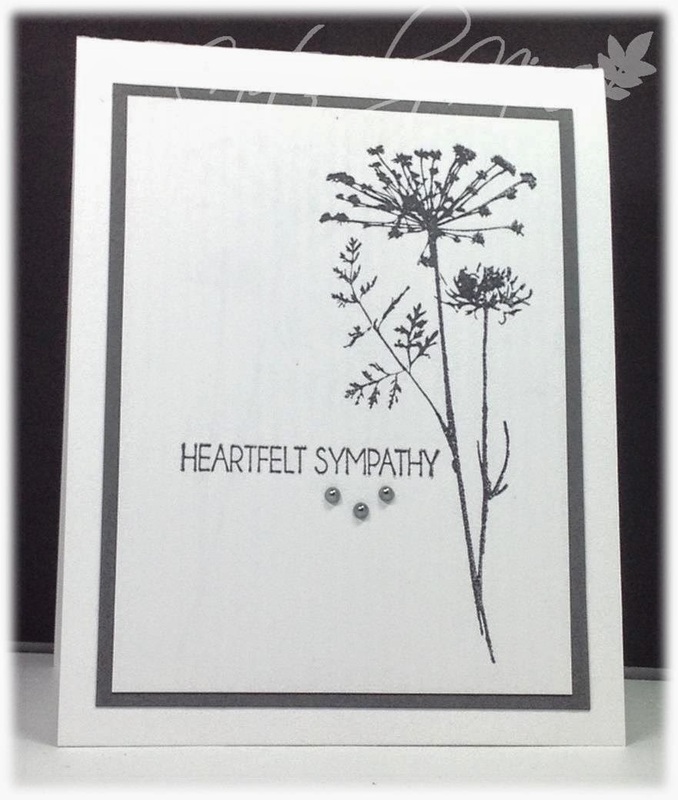 I wanted the card to be CAS, I stamped a large shadow stamp of a meadow flowers and added the sentiment. I finished with some pearls. 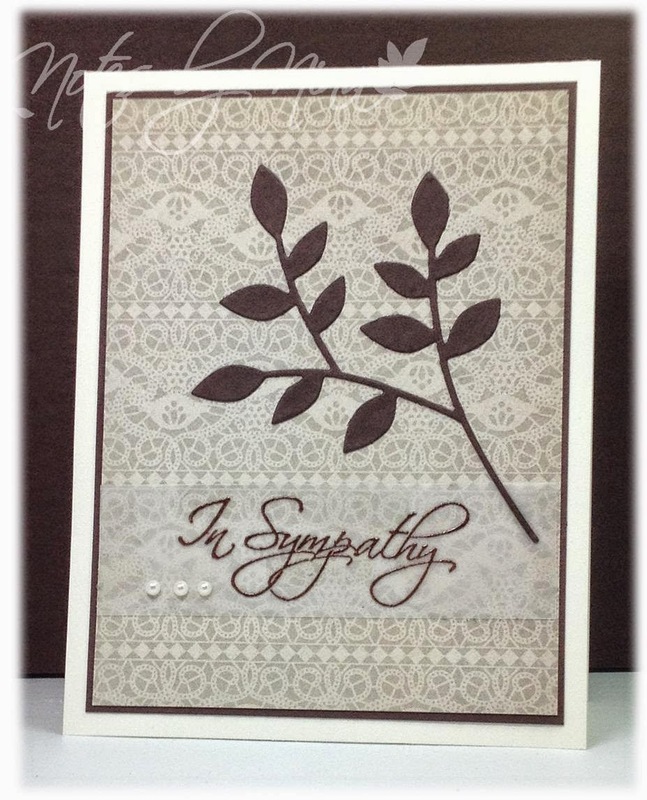 Supplies: White and gray card stock, Inkadinkado-Meadow, KaiserCraft-Sympathy, pearls.